This fabulous 5 Bedroom - 5 Bathroom Villa dates back to the XVIIIth century and lies on the hill of "Poggio Imperiale", one of the most exclusive residential areas of the city of Florence. Being only one mile away from Porta Romana square, a renowned "gate" into the heart of the historic district of the city, the villa is ideally located to visit Florence and its Tuscan surroundings at their very best! Set within a 3 hectare (7.4 acres) estate, this delightful villa is flooded with sunlight and has recently been extensively and carefully renovated by the owners to the highest standards. 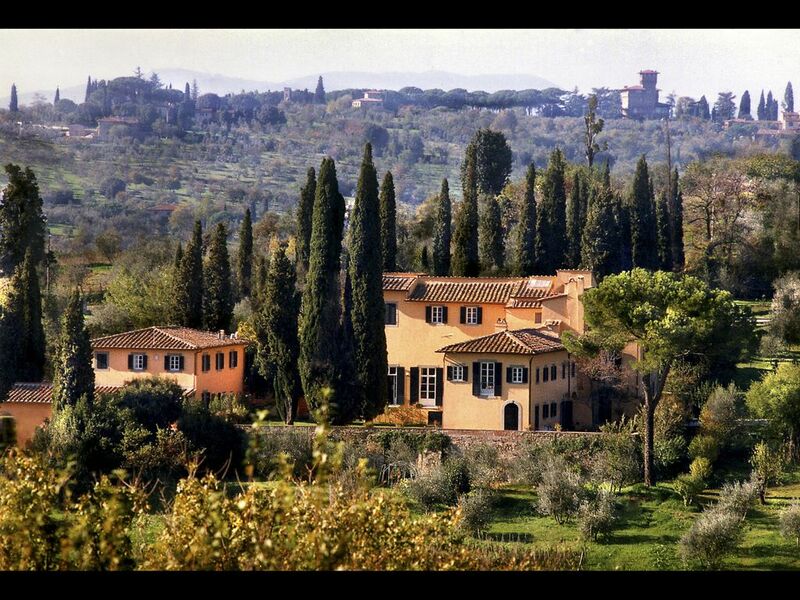 All of the original charm and architectural features have been strictly maintained and are highlighted by the wonderful Tuscan landscape, second to none for its striking beauty. Each living space has been exquisitely appointed to create a sophisticated and cozy atmosphere making the villa a truly unique gem, within just a few minutes from the very best that the city of Florence has to offer. The breathtaking views of the surrounding hills together with the tranquility of the estate create a relaxing, and peaceful atmosphere. The property provides its guests with a unique blend of indoor and outdoor living, perfect for a family reunion, a group of friends traveling together, or an anniversary party…with its 5 wonderfully decorated bedrooms and bathrooms, the villa offers the ultimate accommodation for your dream luxury holiday in Florence! The beautiful typical Tuscan landscape of the villa’s private garden, full of fruit and olive trees, roses, century-old cypresses and pine trees, can be enjoyed throughout the villa. The garden also looks out onto the beautiful Florentine hillside as well as Villa del Poggio Imperiale – from 1737 to 1860 this was the residence of the "Lorena" family, the Austrian Grand dukes of Tuscany. And the Arcetri observatory where Galileo Galilei continued his astronomical research after being called to Florence in 1610 by Cosimo II dei Medici can be seen as well. The wonderful salt-water infinity pool sits right next to the villa’s terrace and garden and comes with a full set of comfortable sun loungers. Being wonderfully exposed to the sun all day, the pool’s water gets really warm (around 31-32 Celsius/88-90 Fahrenheit) during the summer months, while it is heated during the Spring and Fall. The villa’s location is without any doubt one of its most unique and important features. While immersed in the beauty and quietness of the typical Tuscan landscape it is located just about a mile away from Porta Romana square (where the old city walls begin), and represents the beginning of the historic district of the city of Florence. So, all of the cities’ main points of interest can be easily and quickly reached in just a few minutes either by car, taxi, bus or even on foot. Just to name a few examples, world-renowned Ponte Vecchio (Old Bridge) and the Uffizi museum (the very “heart” of the historical district) are only about 1.9 miles away, while the main train station (Santa Maria Novella) and Piazza Del Duomo (Main cathedral) are only about 2.5 miles away. The nearest grocery stores, restaurant/pizzeria, pharmacy, bakery, cafes are located just within a 6-7 minute walking distance. At this same location it is also possible to take the bus that goes right into the heart of the center in just a few minutes. Taxi service works perfectly as well, as taxis usually reach the villa within 3 to 5 minutes from the time they are called (nearest taxi station is only about 1 mile away). Furthermore, from the villa it is possible to easily reach the road leading to the nearby Chianti villages (such as Greve, Panzano, Gaiole), the freeway to places like San Gimignano or Siena, and to the A1 Highway (to reach Rome, Milan, Naples or other places in Tuscany such as Pisa, Lucca). All bathrooms have been completely renovated in 2016 with some of finest, top quality Italian marbles. The outdoor area features a large terrace covered by an automatic awning and comes with a large teak wooden table and a full set of chairs (seating up to 12 guests). To the right of the terrace there is a small laundry room, equipped with a washer and dryer. The private garden develops to the left and in front of the terrace, while the private pool is just below it. The whole outdoor area is immaculately kept at all times and is full of colorful flowers, rosemary and lavender bushes, as well as century-old cypress trees. The property is accessed through a private entrance gate, followed by a driveway leading up to the villa’s main entrance. Mid way through the driveway there is a large gated parking area. Beautiful villa that felt like home away from home. Cozy, comfortable and tastefully appointed. Easy access to Florence City Center. I’d recommend downloading a local Taxi App as they can be a little challenging to secure. The team that supports the villa was lovely. Our trip was that much better because of our stay here.